In Shop-Script you can set up the available set and order of fields which can, or must, be completed during checkout. This setup is available “Settings → Checkout → Multi-step checkout → Contact information” section. By default there is a standard set of contact fields in this section; e.g., “First name”, “Last name”, “Phone”, “Company”, etc. You can use this default set of fields or add custom fields of various types. The first 3 field types are easy to understand—they allow customers to enter an arbitrary text value, a text or a number. Fields of type “selectable (radio)” and “selectable (select)” allow the online store owner to enter a fixed list of values for customers to choose from; e.g., subway stations. 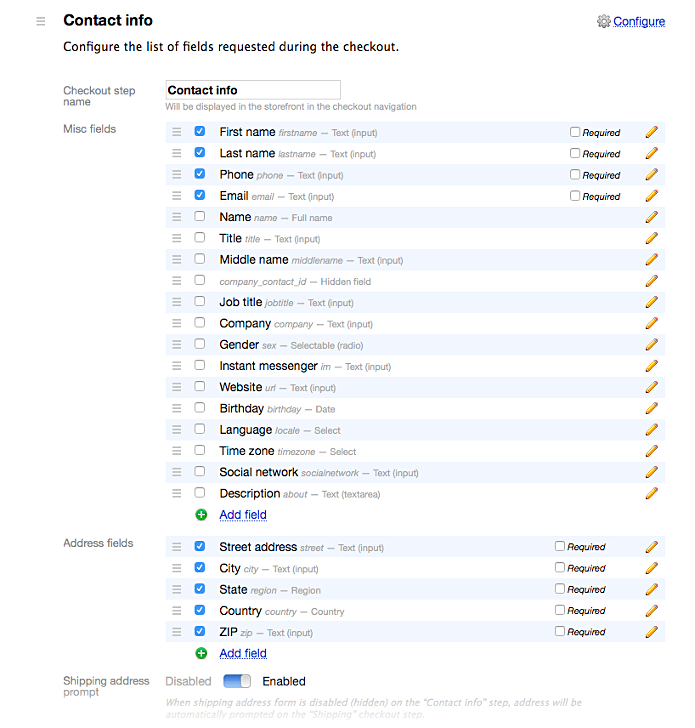 Fields of type “selectable (radio)” also allow you to manage the visibility of other contact fields (except for address fields) using the “Advanced settings” option. Field type “conditional (select/input)” is similar to “selectable (select)”, because it also offers customers a list of values to choose from. However, the contents of this list may depend on the value of another contact field. For example, if your online store delivers orders to different cities which have a subway line, then, depending on the specified city name, the appropriate list of subway stations will be offered to a customer. You can save multiple lists of subway station names, each for the corresponding city name. All available contact fields can be modified: set as mandatory, disabled or enabled, renamed, deleted, assigned different values. If you do not need some of the available fields for a while, you can temporarily disable them. If a field is disabled, you can see its values in backend screen “Customers”, if they were completed and saved before you disabled the field. You can also delete a custom field. But beware: all previously entered values of a deleted field are also deleted without a recovery option. If a field offers a fixed list of values, you can edit each of those values, too. Among contact fields there are address fields. Each of them can be disabled, too, if you do not need to request certain data from your customers. For example, if your online store delivers orders within one country, there is no need to request the country name during checkout. If a field has been disabled, you can assign a default (fixed) value to it. A fixed value is not visible during checkout but its value is nevertheless saved in customer profile. If the selected value of one field; e.g., “Country”, defines the values list of another address field; e.g., “Region” field, then you can disable the “Country” field and select some default fixed value for it; e.g., “United States”—this will make the “Region” list contain USA state names by default.